HDD swivel is a necessary and important part of every horizontal directional drilling job. The pullback swivel has to be able to stand up to not only the tensile forces caused by the pullback, but also the rotational forces and the side loads caused by rocks or certain other conditions. For this reason, the bearings in our swivels are suitable for absorbing both thrust and radial loads. Our HDD swivels have specially designed seals to prevent ingress of dirt to the bearings which would cause premature failures. The seals of pullback swivels can withstand mud, grime and anything else found underground and are designed to be easily serviceable. 1. Geotec Geological Equipment is capable of supplying different HDD swivels, like 15T, 25T, 40T, 60T, 80T, 100T, 200T, 300T, 400T, 500T, 600T, 700T, 800T, etc. 2. HDD pullback swivels produced by our company use the high quality forged alloy steel and the bearing with the superior quality in the world, such as SKF and TIMKEN. 3. It is durable and easy to disassemble for maintenance. Selecting the right pullback swivel should be determined by the capacity of the machine, not just the load being pulled. When choosing a pulling swivel, one should select a unit with equal or greater capacity than the machine it will be used on. Do not hesitate to contact us to help you choosing the right HDD swivel for your next horizontal directional drilling job. 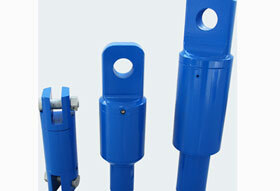 Wuxi Geotec Geological Equipment Co., Ltd. is a professional manufacturer and supplier of pullback swivels in China. Through over 20 years’ production experience, marketing and service experience, we have gained the recognition of a large number of clients both home and abroad. In addition to HDD swivel, our company also provides HDD drill pipe, saver sub, drill bit, hoisting plug, cutter head, drill reamer, and so on. Our products have obtained ISO9001:2000 authentication for quality management system and member certificate of China Mning Association. Our pullback swivels have been widely exported to America, United Kingdom, France, Canada, Australia, New Zealand, Indonesia, India, Russia, Malaysia, Thailand, Mongolia, Pakistan, etc. If you want to buy our HDD swivels, please contact us freely. We are looking forward to cooperating with you.